길이도 넉넉하고 프린트도 아름다운 빨간모자 코스튬입니다. 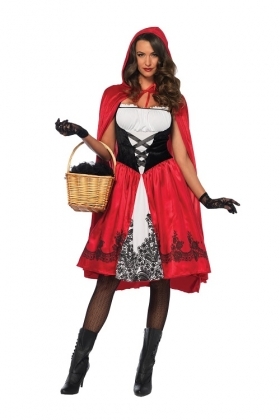 This beautiful classic-looking Red Riding Hood will attract more than its share of wolves! Red knee-length peasant dress with brocade print skirt and matching long velvet hooded cape. Red/black. Basket, gloves, legwear, and footwear not included.